By Cynthia Anger, M.P.A., J.D. Describing her choice to pursue a career in public service, Sandra Day O’Connor, retired United States Supreme Court Justice has said, “I was having a better time at my job than were those of my peers who had opted for private practice. The work was more challenging. The encouragement and guidance from good mentors was more genuine. And the opportunities to take initiative and to see real results were more frequent.” Justice O’Connor’s comments underscore a fundamental truth about public service and one that should appeal to millennials who increasingly enter the job market seeking a sense of purpose. As baby boomers get ready to retire, there is little doubt that government employers will see a more significant impact on their workforce than their private sector counterparts. According to the U.S. Office of Personnel Management, in 2017 the average age of federal workers was 47.5. In comparison, the average age of private sector employees was 42. The U.S. Government Accountability Office reports that more than a third of federal employees were eligible to retire in 2017, compared to just 14 percent in 2012. By 2025, millennials will comprise 75 percent of workers in all employment sectors. In the face of a graying workforce, government managers have expressed concerns about their ability to attract, hire and retain millennials. Whether these concerns are justified, however, is unclear. In 2015, Deloitte undertook a data-driven analysis of four conventional views of millennials in the workplace. The first, the belief that millennials have higher turnover rates than prior generations is false. The data indicate that when length of service is not associated with age of entry, millennials’ turnover rates are comparable to those of other workers. Disassociating age and service is important because millennials stay in school longer and enter the workforce later. The view that millennials are less passionate about their jobs in government is also false. A 2014 survey conducted by OPM found that “millennials and all other generations were equal on employee engagement scores.” Nearly two-thirds of millennials are satisfied with their jobs and would recommend their organization as a good place to work. Eighty-six percent said that the work they do is important. 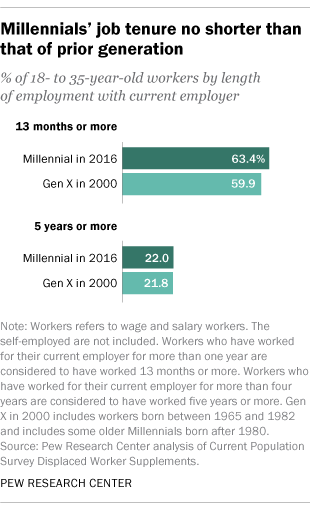 Millennials do not commit to staying at the job. Probably false. One nationally representative poll indicates that millennial government workers are less likely to look for a new job than their private sector counterparts. nonprofits, social enterprises, companies and consulting firms. The range of opportunities may be impacting the overall number of government job seekers and leading to a perception that young workers are uninterested in government work and therefore are harder to recruit. In at least one study, millennials indicated that their top three career goals were work/life balance, job security, and dedication to a cause or service to a greater good. If government managers have cause for concern, it may be because millennials have more opportunities to achieve these goals outside of traditional government employment. Millennials and public service are a natural fit. The pairing caters to millennials’ quest for meaning and purpose and provides the opportunity to develop, lead, and make a difference in people’s lives. Emphasizing the social impact, creativity, and innovation is one way to attract and retain public serice-minded millennials to government jobs.